Of the Big 3 Japanese design houses with perfume lines — Rei Kawakubo/Comme des Garçons, Yohji Yamamoto and Issey Miyake — it's Miyake's fragrances that have interested me the least (with one big exception, Feu d'Issey, and a smaller exception, a scent by issey miyake). Miyake's most famous perfumes, L'Eau d'Issey and L'Eau d'Issey Pour Homme, spawned almost-countless imitators, and the two "origin" perfumes today smell like caricatures of "fresh" fragrances (plenty of cleaning products smell like them, cleaning products you can buy at Target). Still, I approached the new Nuit d'Issey1 with an open mind (and nostrils). Nuit d'Issey starts with greenish citrus (I smell mostly grapefruit) with a sweet-spice accord. There's a momentary hint of what smells like cumin or perhaps the "sweaty" aspects of grapefruit and black pepper. Quickly, the sweat is covered up as Nuit d'Issey turns talc-y; the talc accord smells mostly of woody vetiver and incense (the scent of fresh incense in the box...not burning incense or incense reduced to ash). Near the end of its development, Nuit d'Issey becomes soapy, with aromas of sheer cedar, tonka bean, and more incense-tinged vetiver. The longer Nuit d'Issey wears, the more incense I smell (though the incense never approaches Comme des Garçons incense intensity). 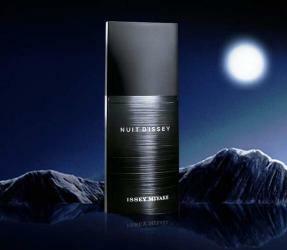 Nuit d'Issey's extreme dry-down is super-dull: fresh, synthetic woody musk presides. Nuit d'Issey is squarely in the designer/department store fragrance category: it smells clean (the citrus, talc and soap), contemporary and middle-of-the-road — no ingredient is troublesome, weird or too powerful. That said, Nuit d'Issey smells O.K. and I wouldn't mind sitting next to someone wearing it. I might recommend Nuit d'Issey as a "starter-incense" cologne for Axe-reared teens; it's perhaps a good option for those who like their incense light. I assume Nuit d'Issey's "nuit" aspect is represented by the incense (and maybe soapy-talc-y bath time?) If I had been consulted, I would have insisted on a "creamy" floral component, some white flower — lily of the valley, angel's trumpet, or night-blooming jasmine. I've not had the chance to smell other recent Miyake offerings; do comment if you've tried L'Eau d'Issey pour Homme Sport Mint and/or L'Eau d'Issey Pour Homme Yuzu. Issey Miyake Nuit d'Issey has good lasting power and sillage; it's available in 75 ($66) and 125 ($87) ml Eau de Toilette. 1. Developed by perfumers Dominique Ropion and Loc Dong; listed notes of grapefruit, bergamot, leather accord, spices, black pepper, woods, vetiver, patchouli, incense, tonka bean. Well, that’s a shame. When Robin first mentioned it I was hoping it would be a proper parfum de nuit, something dark and mysterious and maybe even dangerous. Not many of those around any more. R, wish I could try the Yuzu…but doubt it has the BOMB of yuzu I’m hoping for. So many of these flankers just don’t appear in the U.S. I saw and tried both the mint and yuzu in sephora(im in Maryland). I liked them both better than the regular L’eau PH. Rictor…good grief…a continent away! They never made it to Seattle Sephora…. I generally like Kenzo better than CdG. The CdGs are fun: I enjoy trying them and am glad they exist. Ultimately, however, I find my favorite Kenzos significantly more subtle and pleasing to wear. I need to make some time to get to know Feu. It wasn’t love at first sniff, but when you and LT both recommend it, I know the rewards are there for those who keep an open mind/nose. noz: Kenzo must to WAY better feminine scents than men’s…the only one I’ve bought is Kenzo Air. It’s hard to get your hands on Feu d’Issey these days…and it does not age well in the bottle…such is (perfume) life! Thanks for your review Kevin. I sampled Nuit at the airport, and I classified as a shopping mall version of Shaal Nur Etro. On my skin it does not really turn powdery – I’d say more dusty, if it makes sense. I find it quite forgettable. I quite like the original L’Eau, especially the side products (the aftershave balm is lovely), but the rest of the flankerfamily left me indifferent, perhaps with an exception for the Summer version L’Ete’. Lupo: good to know, thanks. I will stick with my zingy Yuzu Fou and forget about the Miyake!